“Adornment is hugely powerful. 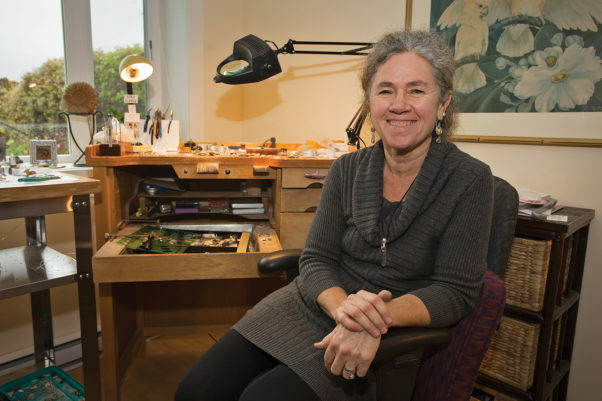 It is our own very unique personal expression and makes us feel good,” says local jeweler Cheryl Jacobs, in her Cumberland studio. How do artists navigate longevity? What happens when they hit the point where they can confidently call their work “mature,” when they count their journey in decades, not years? Do they finally relax, or do they fear running out of steam? How do they stay relevant? How do they stay inspired? Jacobs, who is turning 60 this year, is clearly growing. She’s an established artist who sells her work in galleries across Canada, and is in demand as a teacher throughout Vancouver Island, but she’s certainly not slipping into complacency. Earlier this year she moved from Denman Island, where she’d lived and worked for 23 years, to Cumberland, where her new studio on Maryport Road will be featured on the Central Island Studio Tour November 25-27. The move gives her easier access to the wider world. This also represents change—after 20 years spent making jewelry full-time in the relative isolation of her Denman Island studio, she’s now restructured her life to include more variety. A lot more variety. As well as working in her studio, she teaches at North Island College and at community centres from Ladysmith to Campbell River, takes private students, and works part-time at the Rusty Rooster, a Cumberland boutique that sells her jewelry. “I’m loving the diversity of my life right now. All these activities mean I stay inspired,” says Jacobs. She still loves Denman Island and feels it’s important to stay connected to the artistic community there. One of the highlights of her holiday season will be participation in the Denman Island Christmas Craft Fair December 3 and 4, where her table has been a stalwart for 23 years. “I started exhibiting at the Denman Fair in 1993 and have never missed a year. Over the decades I’ve done hundreds of fairs across Canada and the Denman one is still my favorite. The size of the fair is just right, and the quality of the work is astounding. It’s got such a delightful sweet neighborhood atmosphere. You walk out feeling great. You’ve had a great meal, talked with wonderful people, and you’ve seen lots and lots of amazing art,” she says. Fairs like this one are not just a chance to sell work, says Jacobs. They also give her something she craves—a relationship with the people who buy (or even just admire) her work. She loves to hear people’s questions and comments, to witness and support their process of choosing the right piece, and to hear how meaningful her work is to them. “People are so attracted to the stones,” Jacobs says. “They feel something from my pieces. I had one woman pick up one of my Buddha necklaces and she burst into tears, because her mother had just died and the Buddha represented that for her. She knew she needed to wear that Buddha with the Rose Quartz beneath it; she knew it would be so healing. Meaning is a word that keeps coming up in conversation with Jacobs. This too is part of her evolution as an artist. “I feel like I’m stepping more deeply into my own power. I want more meaning in my jewelry. I was starting to feel like a machine, filling orders for 15 galleries across Canada, making hundreds of pieces a year. These days I want every piece to feel really special. One the biggest changes for me is that instead of doing what galleries dictate, I’m telling galleries, “I’m sending you something I adore, and if doesn’t sell, you can send it back.” At this point in my life I want to do only what I really want to do,” she says. And what she really wants to do, increasingly, is imbue her work with spirituality. For Jacobs, this comes from her practice as a Buddhist meditator. “I am hugely on a spiritual path,” says Jacobs. “I meditate every day. This is reflected in my jewelry.” The result is a new line of devotional jewelry with tiny Buddhas and lotus flower motifs, unlike anything Jacobs has produced before. Some of her pieces include seashells and pebbles picked up during her long walks on Denman Island beaches, set in silver, both earthy and elegant. 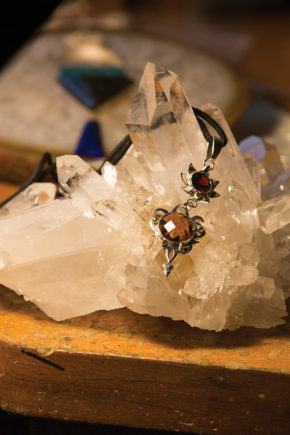 A special piece of jewelry can tell a story, hold memories, connect us to our deep beliefs, or feel like a talisman that offers protection or strength. There’s a reason our myths so often contain rings of power and magical amulets. In the past few years, Jacobs has felt her connection to the stones she uses deepening. “The stones came more into play as I meditated more. The stones talk to me. Maybe that sounds woo woo, but the stones really do communicate. Stones are earth, they are energy, and I feel I’m working with energy. “Something new for me is that I let the stones take the lead. They are telling me what to do—one wants to go here, one wants to go there.” More and more, she is trusting those messages, letting them take her down new paths as an artist. That curiosity and openness to new paths and the ability to be energized by change has been with Jacobs since she began her artistic career. She comes from an artistic family, and grew up watching both her grandmother and mother paint. She knew early on that she would be travelling an artist’s path in life, although she didn’t know that jewelry would be her chosen medium. She was initially drawn to fashion, and studied fabric arts at Capilano College in Vancouver. 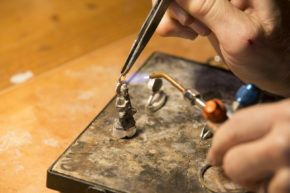 While in California, Jacobs, out of curiosity, signed up for a silversmithing class at San Francisco State University. “I was hooked right away,” she says. When Jacobs’ son was born, she decided to combine parenthood with self-employment. “I stayed at home and made jewelry. My first account was a fantastic clothing store in Berkeley. The owner provided me with stones and metal and let me make what I wanted. He had a whole big store for me to fill.” During this period, Jacobs, always keen to try new things, learned goldsmithing and began making pieces in that metal as well. In 1993, Jacobs and her partner felt ready to find a more tranquil environment to live and raise their son. On a trip to Canada they found Denman Island and fell in love with the forest, the beaches and the quiet community of a little more than 1,000 people. But moving to Canada meant leaving her California contacts behind and, in terms of her career, starting more or less from scratch. She worked for a while as the manager of the Comox Valley Art Gallery, and then got a self-employment grant to upgrade her skills. She used the opportunity to learn casting, which meant mastering new techniques and getting comfortable using new equipment. As usual, the challenge of the new inspired her. “I jumped in, applied at galleries, made a new line, and finished my studio,” she says. Jacobs has consistently approached her career as if it were a great big adventure, always seeking out new paths both for her art and her marketing. “I’ve tried everything. I tried to get onto TV, and I was accepted. I tried to get my work on BC Ferries, and was accepted. I hired a rep and worked with her for a couple of years, but reps take a big cut. I opened a studio on Denman Island that contributed hugely to my income for 20 years. I travelled to Vancouver, Alberta, and Toronto for big shows that cost $2,000 just to get in, dragging my kids along,” she says. These days, she’s pulled back from the cross-continental travel and the big push to get her work to market, in favor of a more sane lifestyle and the pursuit of a newer passion—teaching. “I love, love, love teaching!” she says. “I love turning people on to beginners’ jewelry. It’s such a hit of absolute wonderfulness.” Five years ago Jacobs was hired by North Island College to help develop a Metal Jewelry Design Program, and she has been teaching there ever since, as well as continuing to teach at rec centres, and to take on private students and apprentices. Recently, Jacobs has opened an Etsy account to sell her work online, potentially reaching a global audience. At the same time, she has lots happening locally, where she can foster her connection to her clients and her community. She is busy this season with not just the Denman Island Christmas Craft Fair, but also the Stagnhare and the Charles Dickens Christmas Craft Fairs in Courtenay. “There are so many craft fairs these days, and so many people going to them. More and more, I hear people saying that they appreciate a beautiful hand-made work of art. I hope it just keeps growing,” says Jacobs. There’s little doubt if there’s growing happening, Jacobs will be part of it, embracing change, learning, trying new things, and staying as motivated as ever.